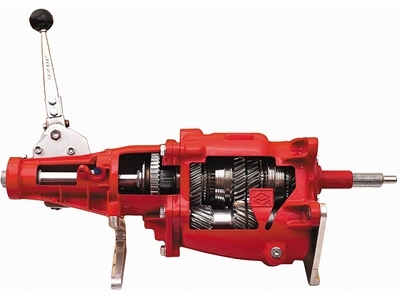 If you are like many four-on-the-floor muscle car owners you will tend to overlook replacing the gear oil in your Muncie (M20, M21, or M22), Borg-Warner Super T-10, or Super T-10 4-speed transmission. It is easy to overlook this type of general maintenance. After-all if you pop the hood you get reminded of changing the motor oil, draining and refilling the coolant, etc. If you have an automatic transmission the transmission dipstick which is generally easily visible in the engine bay, is a constant reminder of regular automatic transmission maintenance. Muncie and Borg-Warner T-10 and Super T-10 4-speed manual transmissions sit underneath the car hidden away like a groundhog burrowed deep in a ground hole. Forgetting their existence becomes par for the course. Even if you do remember to check the gear oil level, you have to slide under the car and remove one of the drain plugs. And in some cases this is easier said than done if you happen to own something like a Chevrolet Corvette, Chevrolet Camaro, or Pontiac Firebird which sits very low to the ground. If you happen to have a Muncie, T-10, or Super T-10 in need of a gear oil change or if you can’t remember the last time you replaced the gear oil, there’s no better time than the present to do this job. You should change the gear oil every 3 years or 15,000 miles whichever comes first. However check your owners manual or shop manual because some Muncie or T-10 units may require different oil change intervals. The positive is the job is straight forward and can be done within an hour with the right tools. The downside is the job can be messy. 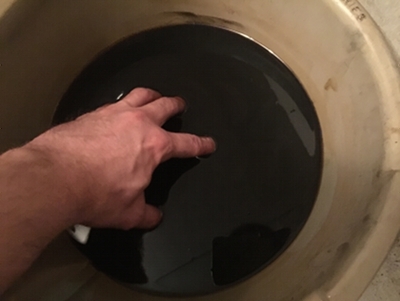 Gear oil is among the smelliest stuff you’ll ever put in your car and when you get it on your clothes, hands, or hair you aren’t going to be getting hugs from your spouse. Deciding to do the job is half the battle the other half is finding the correct fluid to put in your Muncie, T-10, or Super T-10. Unfortunately you are going to find that most auto parts stores carry only GL-5 or newer spec gear oil. This can pose a problem since the Muncie, T-10, and Super T-10 all have internal parts and gears which need a special gear oil with additives. Many GL-5 or newer spec lubricants won’t properly protect these Muncie, T-10, and Super T-10 parts potentially leading to excessive wear which can cause transmission problems usually leading to an expensive rebuild of the entire transmission. GL-5 gear lubricants are blended to provide the ultimate protection for newer manual transmissions and axles. There is an exception if the GL-5 lubricant says it meets the MT1 standard or GL-4/MT-1 standard then it is safe to use. But if these lubricants have limited slip differential additive added then you don’t want to use them since that additive could cause future transmission issues. Not to further confuse there are the latest GL-6 gear lubricants which you also must check to make sure that they meet the GL-4/MT-1 standard. The best lubricant to use in a Muncie, T-10, or Super T-10 is a conventional GL-4. Stay away from synthetic lubricants since there have been too many Muncie, T-10, and Super T-10 owners who have used synthetic lubricants and have had their transmission synchronizers succumb to premature failure. It is believed that the more slippery synthetic fluid doesn’t offer enough protection for the synchronizers in Muncie, T-10, and Super T-10 transmissions. Pontiac expert Rocky Rotella mentions this issue in his “Improving Performance Your Super T-10 Transmission – Super T-10 Supertune” article. The oil industry as a whole is moving towards synthetics so it is easy to get caught up in the momentum. 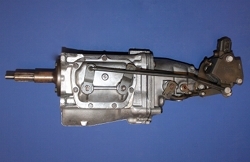 The Muncie 4-speed which was available on some GM produced cars, last saw production back in mid-1974 when the Watergate scandal was front page news. And a Super T-10 equipped new performance car last rolled off the assembly back in the early-1980s. This was long before the widespread use of synthetic lubricants. This is why using a good conventional GL-4 lubricant is imperative. CRC Sta-Lube produces a SAE 85W90 GL-4 gear oil (SL24229) which is perfectly suited to all Muncie, Super T-10, and most T-10 4-speeds. Though originally most Muncie, Super T-10, and T-10 units came from the factory with 75W90 conventional gear lube, it is becoming very hard to find 75W90 conventional in the modern era – 80W90 and 85W90 are more commonly found and both can be safely used as a 75W90 replacement. Sta-Lube SL24229 will protect all the components in these classic 4-speeds and this includes their synchronizers. And it works very well in original Muncie, Super T-10, or T-10 units where the seals have never been replaced. And this is especially important since synthetic gear oil tends to leak out of older transmissions at a much quicker rate than conventional gear oil and this is important to remember since synthetics will also hit your wallet harder. 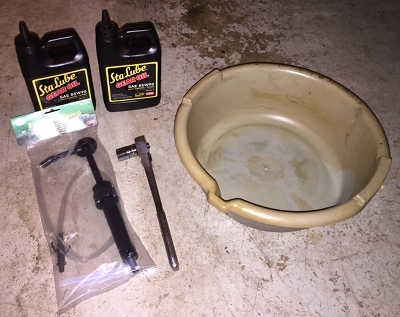 If you don’t have these items they are not expensive to purchase and all but the gear oil can be used over again for future manual transmission oil drain jobs. The first order of business is making sure that you have access to the transmission underneath your car. You should be able to view and touch with at least one of your hands the two transmission square head drain plugs on the passenger side of the transmission. The drain plugs are square and point directly towards the passenger side door. 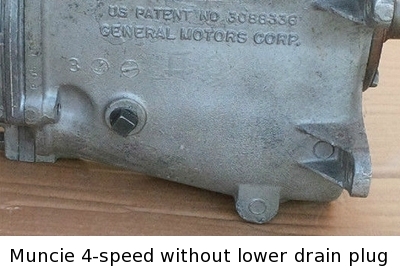 Some Muncie units only have a one drain plug (the upper one). You may have to lift the car securely using the correct jack stands for your car’s weight or use car ramps to raise the front tires. This will give most newbies to the job plenty of access to the transmission and will make it easier to remove the square head plugs. In some cases a previous owner or the last person to change the fluid may have overtightened the plugs and if you try to remove the plugs without lifting your car and your body is lying next to the car you may hurt your shoulder or rotator cuff trying to remove the plugs. The plus side is that if you don’t overtighten the plugs, the next time you do the job you may be able to do it without lifting the car (as I was able to do for this article). If you have to lift your car make sure you have followed the car manufacturer’s procedures for lifting the car and if you use ramps make sure the ramps are rated to handle your car’s weight. Be sure to engage your emergency brake, leave the car in 1st gear, along with using tire chocks on the tires still on the ground to ensure no movement of your car. When you have determined you have access and are ready to loosen the bolts, slide your oil drain pan underneath the transmission directly under the drain plugs. 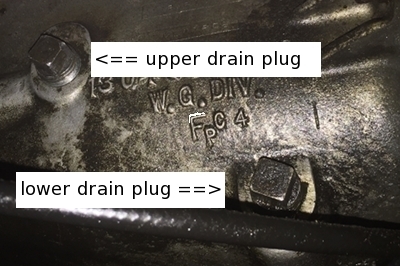 Next using the socket wrench with a 9/16 8-point socket, be sure to remove the upper drain plug. Do not remove the bottom one first. In case you have not lifted your car and you remove the bottom plug first and all the fluid drains out, and then when you try to loosen the top one and discover it won’t budge due to not enough leverage from your position – you will need to lift your car. You will have put yourself in a really bad pickle and will have to figure out a way to move the car or to lift it with no fluid in the transmission. This is why the top drain plug should always be removed first. If you find the upper plug or the bottom plug is too tight, you can still drive your car to lift it or roll it onto ramps because your transmission will be full of fluid. For this job you should only use a 9/16 8-point socket. The 8-point socket is specially made to remove square head bolts. Using a socket which isn’t an 8-point will damage your square plug. 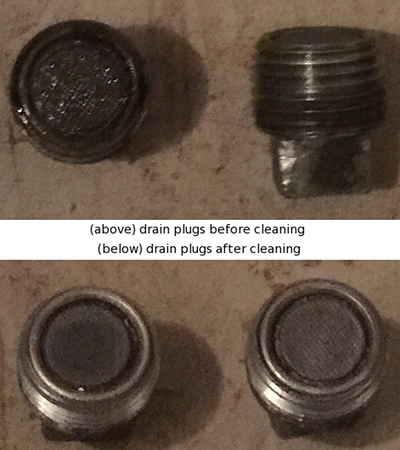 If you find that your square plugs are slightly stripped, rounded, or deformed due to someone in the past not using the correct 9/16 8-point socket, you may need to take the vehicle to a transmission shop to have the plugs removed or you can move up a socket size to a 5/8 8-point socket and place a shop cloth (a cloth with tough cloth material not tee-shirt thin cotton) over the square head and then using your hands (don’t hammer or bang) push the 5/8 8-point socket onto the cloth which will act as a layer of protection between the socket and the square plug. Before you turn the socket with the wrench make sure the socket is snug and doesn’t have any wiggle room. This should allow you to remove the plug. If the plug is slightly damaged you can usually file it down with a metal file where it’s out of shape (not too much) to return it back to a square shape. If the plug is beyond repair it should be replaced with the correct replacement plug. Once the bottom plug is removed the old gear oil will drain into the pan (if you have an old Muncie without the lower fluid plug, you will at this time use the fluid/oil extraction pump to remove the fluid via the upper plug hole). While the fluid is draining clean off the old plugs with a paper towel or a shop cloth. You’ll notice that there are some small metal filings and debris attached to other side of the plugs which was picked up by the round magnets inside the plugs. This is normal and a good sign that the magnets are picking up these filings so they won’t float freely in the gear oil which can cause premature transmission failure. This is why it is important to clean all the debris off the magnet so when the plugs are back on your transmission they will continue to grab these metal filings until your next oil change. When the bottom plug is removed make sure your oil drain pan is placed directly underneath the drain plug hole to catch the transmission’s old gear oil. Once the oil has stopped draining into the pan, place the drain plug back into the lower hole and turn by hand. Do not use a socket wrench to tighten the plug until you have turned the plug by hand until it stops. This is very important because you can strip the threads in the hole if you don’t tighten by hand first. Once you have hand tightened the plug then it can be tightened snuggly with the socket wrench. Be sure when tightening with the socket wrench that you tightening snuggly but don’t over-tighten. If in doubt with how tight use a torque wrench (and check your vehicle’s shop manual for how much torque to apply to the drain plugs). Remember if you don’t over-tighten the lower drain plug you can change the oil next time without lifting your vehicle making the job quicker and easier. Now for the fun part, this is optional. You can stick your hand in the gear oil in your oil pan and slowly move it around the bottom to check for metal filings. If you don’t like getting your hands dirty you can run the oil through a strainer. If you find a lot of metal filings in your oil you may want to take your vehicle to a transmission shop for evaluation or drain your oil again in a few months to check for metal filings again after driving your vehicle at least a handful of times. 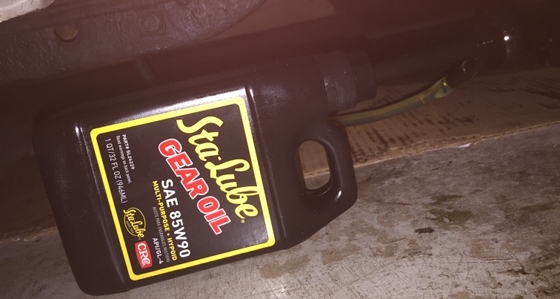 Now that all the oil has been removed from the transmission you can connect the Sta-Lube SL4344 fluid pump to the Sta-Lube hypoid SAE 85W90 GL-4 (SL24229) gear oil bottle. You’ll notice that there are two clips that are about an inch bellow the pump nozzle make sure these grip the top drain plug hole before you start pumping. You will at this time pump in the contents from the bottle until the bottle is empty. Then you will attach the pump to the second bottle and continue pumping the fluid. Somewhere before the end of the second bottle the fluid will begin to drain out of the top hole when this occurs pinch the two clips on the pump nozzle to release it from the hole. After that tighten by hand the upper drain plug and then tighten with the socket wrench (but not too tight) following the same procedure as the lower drain plug. Now comes the test drive – take your classic car out for a drive. Be sure to check underneath your car where it is parked to see if your transmission is leaking. For older units that have not been rebuilt in the last 15 years, it is going to leak a little. fIf you notice leaking be sure to check every few months the fluid level by removing the top drain plug. You can slide your finger in the hole to determine how much the fluid has dropped. If it has dropped you only need to add some fluid until it starts pouring out the top hole which will be the sign that you can attach and tighten the upper drain plug. Be sure to follow the guidelines of your local jurisdiction for proper disposal of your old gear oil. And remember to change your fluid at least every 3 years or 15,000 miles (whichever comes first) and your Muncie, Super T-10, and T-10 should reward you with many years of reliable service.